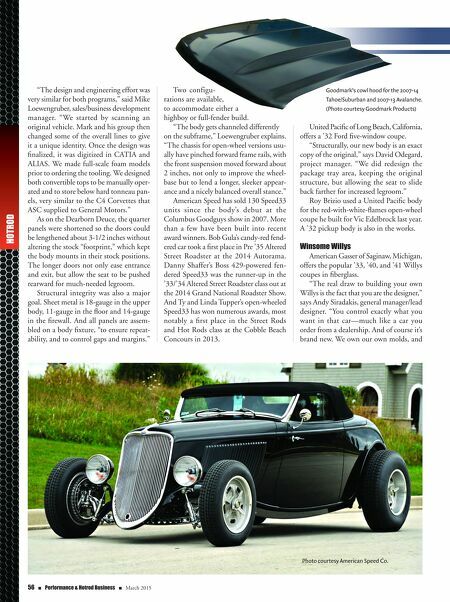 56 n Performance & Hotrod Business n March 2015 HOTROD "The design and engineering effort was very similar for both programs," said Mike Loewengruber, sales/business development manager. "We started by scanning an original vehicle. Mark and his group then changed some of the overall lines to give it a unique identity. Once the design was finalized, it was digitized in CATIA and ALIAS. We made full-scale foam models prior to ordering the tooling. We designed both convertible tops to be manually oper- ated and to store below hard tonneau pan- els, very similar to the C4 Corvettes that ASC supplied to General Motors." As on the Dearborn Deuce, the quarter panels were shortened so the doors could be lengthened about 3-1/2 inches without altering the stock "footprint," which kept the body mounts in their stock positions. The longer doors not only ease entrance and exit, but allow the seat to be pushed rearward for much-needed legroom. Structural integrity was also a major goal. Sheet metal is 18-gauge in the upper body, 11-gauge in the floor and 14-gauge in the firewall. And all panels are assem- bled on a body fixture, "to ensure repeat- ability, and to control gaps and margins." Two configu- rations are available, to accommodate either a highboy or full-fender build. 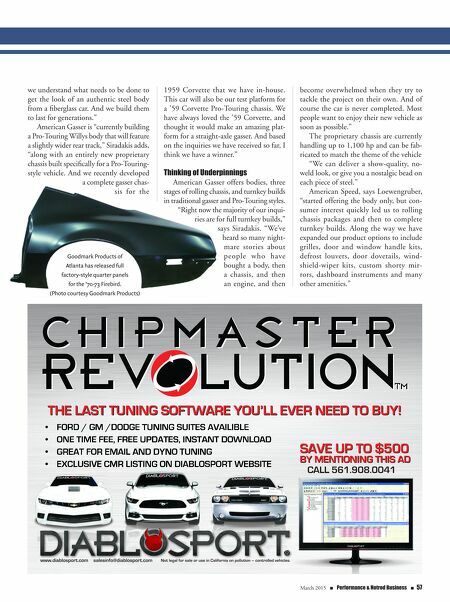 "The body gets channeled differently on the subframe," Loewengruber explains. "The chassis for open-wheel versions usu- ally have pinched forward frame rails, with the front suspension moved forward about 2 inches, not only to improve the wheel- base but to lend a longer, sleeker appear- ance and a nicely balanced overall stance." American Speed has sold 130 Speed33 units since the body's debut at the Columbus Goodguys show in 2007. More than a few have been built into recent award winners. Bob Gula's candy-red fend- ered car took a first place in Pre '35 Altered Street Roadster at the 2014 Autorama. Danny Shaffer's Boss 429-powered fen- dered Speed33 was the runner-up in the '33/'34 Altered Street Roadster class out at the 2014 Grand National Roadster Show. And Ty and Linda Tupper's open-wheeled Speed33 has won numerous awards, most notably a first place in the Street Rods and Hot Rods class at the Cobble Beach Concours in 2013. United Pacific of Long Beach, California, offers a '32 Ford five-window coupe. "Structurally, our new body is an exact copy of the original," says David Odegard, project manager. "We did redesign the package tray area, keeping the original structure, but allowing the seat to slide back farther for increased legroom." Roy Brizio used a United Pacific body for the red-with-white-flames open-wheel coupe he built for Vic Edelbrock last year. A '32 pickup body is also in the works. Winsome Willys American Gasser of Saginaw, Michigan, offers the popular '33, '40, and '41 Willys coupes in fiberglass. "The real draw to building your own Willys is the fact that you are the designer," says Andy Siradakis, general manager/lead designer. "You control exactly what you want in that car—much like a car you order from a dealership. And of course it's brand new. We own our own molds, and Goodmark's cowl hood for the 2007-14 Tahoe/Suburban and 2007-13 Avalanche. (Photo courtesy Goodmark Products) Photo courtesy American Speed Co.